Coconuts is a Bristol example of the Krogen Express 49′, likely the finest first generation KE with a meticulous maintenance record and an exceptional upgrade history. Following an extensive 2-year refit, her owners of 10 years have completed the Great Loop not once, but twice. With her James Krogen designed semi-displacement hull, she’s equally comfortable at 9 knots, burning just 5 gph, and 15+ knots. 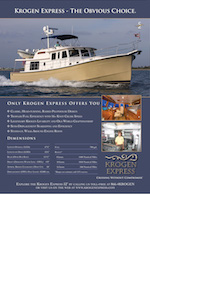 Dressed in classic Flag Blue and adorned with a stunning teak transom, this Krogen Express continues to turn heads wherever she goes. The spirit and virtues of commuter yachts of the twenties and thirties were reborn in a craft destined for the twenty-first century with the introduction of the Krogen Express. With upgraded twin 420 hp Caterpillar 3126s, the graceful style of the Krogen Express 49′ is easily matched by her exhilarating mid-teen cruise capabilities. At the same time, her efficient semi-displacement hull delivers trawler economy at displacement speeds. Conceived and styled by Kurt M. Krogen and designed and engineered by the late James S. Krogen, she delivers traditional quality and exceptional value. Finely finished to the most exacting specifications, her fluid lines and exceptional performance will satisfy the most demanding yachtsmen for years to come. Based on the test data and sea trials, it is evident that the 49′ is one of the best performing semi-displacement motor yachts available. Her spacious pilothouse, wonderfully livable salon and aft deck, generous staterooms, walk-in engine room, and superb finish make her an exciting and uniquely attractive package. She comes with a long list of standard equipment including: custom entertainment cabinet in salon, reverse cycle Cruiseair® with SMX controls, Northern Lights® generator with sound shield, AquaDrive® system, Lewmar® windlass, Glendinning® Cable Master, underwater exhaust, MasterVolt Combi 4kw inverter/200a charger, and lead lined sound insulation in the engine room, to name just a few. Designed by James Krogen, the KE49′ combines classic, timeless style with exceptional seakeeping and efficiency. Her plumb stem, raised bow, and broad beam forward allow her to slice through the waves with ease while providing surprising space in her accommodations. The KE49’s low profile allows her to get under bridges as low as 17′ and with a draft of just 4′, she’ll take you places most 50 footers won’t. Her semi-displacement hull delivers trawler efficiency at displacement speeds with true cruise capabilities in the mid-to-upper teens. The generous keel provides stability and protection for her twin 26×22 propellers. Boarding a Krogen Express 49′ is easy with a large transom door and boarding gates on either side of the spacious, covered, teak-soled cockpit. Ample storage for lines, fenders, cleaning supplies, bicycles, and more, is provided by the cavernous lazarette below, which is unencumbered by ship’s equipment. Entering the salon through custom French doors, her owners are treated to an inviting cherry wood interior. Along with her sumptuous joinery, old world craftsmanship is obvious with the quality of her appointments and overall fit and finish. Legendary Krogen livability is evidenced by the large sliding side windows and generous headroom along with the integral galley-up design. The L-settee to starboard, nicely appointed in Navy Blue Ultrasuede fabric, is ideally situated for enjoying the built-in Samsung LCD TV. With considerable additional underdeck storage to port, abundant space can be found under the settee as well. The 11′ x 6′ 6″ covered cockpit provides protection from the elements while providing convenient access to the swim platform and salon. The spacious lazarette, which was cleaned and painted last year, is accessed via the large hinged hatch below the cockpit sole and provides ample storage for lines, fenders, spare anchor, cleaning supplies, and more. Below you’ll find a new, oversized Accusteer hydraulic pump for the autopilot as well as new hoses and actuator switches for the trim tabs. The 50 LED light fixture, hoses for the deck drains, and the 1500 gph bilge pump were all new in 2018 as well. The salon is accessed from the covered aft cockpit through custom French doors which allow lots of daylight and fresh air into the cabin. Located to starboard, the comfortable L-shaped settee has storage beneath and a nice end table forward. The teak hi-lo table has leaves that fold out for expanded seating capacity. The settee is covered in attractive Navy Blue Ultrasuede fabric. To port is plenty of space for your choice of recliners or club chairs. Oversized screened windows on both sides allow lots of light in and good viewing for the crew. The chef will feel right at home in this well-equipped galley with Corian® counters nicely fiddled to contain spills and keep dishes in place. Standard appliances include a microwave, electric glass cooktop and oven, and 14 cubic foot refrigerator/freezer with ice maker. The abundant counter space is complimented by plenty of storage both above and below, including wet storage accessed from the corner of the counter top and a custom 6 cu. ft. pantry. Stylish round opening portlights on both sides provide light and natural ventilation. The raised pilothouse provides excellent visibility and easy access to the fly bridge and side decks. The centerline helm has a chart table to starboard and plenty of room for engine instrumentation and the Furuno navigational electronics. The optional Mathers Microcommander provides precise, one lever control of the engines. The settee is raised for excellent forward visibility, making it a proper watch berth. It’s long enough for sleeping and pulls out to accommodate two. The teak and holly flooring is both practical and attractive. Custom sliding doors on both sides provide quick access to the side decks. The pilothouse settee is raised for excellent visibility and long enough for sleeping under way, making it a proper watch berth. The settee pulls out to a 3/4 double to accommodate a second guest. There are numerous compartments beneath the settee and a reading light above. The small table is ideal for working on a laptop, serving snacks underway, or planning the next day’s journey. Just a few steps forward and down from the Pilothouse is the accommodations area. To starboard is access to the walk in engine room and the Kenmore stacked washer dryer combo. Forward of the washer dryer is the guest stateroom while directly forward is the master stateroom. To port is the guest stateroom, complete with stand-up, fiberglass shower. Stairs lead down the forward companionway to the full-height door into the stand up engine room. The convenient access to the well thought out machinery space makes daily maintenance routines a satisfying experience. Down the centerline is brightly polished diamond deck plate that looks nearly new. There is plenty of room to get around the extremely well maintained and upgraded 420 hp Caterpillar 3126TA diesels driving Twin Disc gears. Detailed maintenance records are posted on the centerline. Engines are fired by 8D AGM starting batteries. Fuel for the engines and generator is filtered by Racors which have been substantially upgraded with vacuum gauges, bowl drains, and water sensors. Abaft the engines are the 150 gallon fresh water tanks and aft of those are the 300 gallon fuel tanks. Above the starboard tank is a 240v blower for bringing fresh air in while to port a pair of 12v blowers remove engine room air. To port is the Sea Fire system upgraded in 2018. Aft of the starboard engine is the Marco oil changer system. The Aqua Drive systems, upgraded in 2010, reduce vibration transmitted into the hull. The prop shafts were upgraded to Aquamet 22 and newer Tides Sure Seals keep sea water out. Prop shafts were fitted with Michigan Wheel Dyna-Quad 26 x 22 Nibral props in 2011. The newer 12 Kw Northern Lights® generator is kept quiet in its insulated sound shield and started with a dedicated 4D AGM battery. With its practical desk/computer station and comfortable settee, the GSR provides comfortable accommodations for your guests as well as a retreat for her owners once the guests leave. The Pullman berth slides out wide for added comfort while the settee provides the primary accommodation. In addition to the large hanging locker (with access to electronics), there are drawers below the settee and in the desk. Across the companionway is the guest head and adjacent is the stacked Kenmore washer/dryer. Across the companionway from the guest stateroom is the guest head with full stall shower and teak floor grate. High quality Scandvik fixtures are easy to operate and look great. The reliable Vacuflush head assures simplicity of operation while a Manship portlight and solar overhead fan provide ventilation. Abundant storage and four towel bars assure the comfort and convenience for Coconut’s guests. Beneath the guest stateroom, in a compartment away from the heat of the engine room, are the 3 CruiseAir systems, water heater, freshwater pump, and transducers. Shut off valves have been installed on both sides of the seawater strainer to make servicing easier. The A/C seawater pump has been replaced (2015) as has the distribution manifold. In 2018, the light fixture was upgraded to a 36 LED unit. Below the master stateroom is access to the holding tank (with 2nd filter installed), shower sump system (upgraded 2017), and bow thruster. A new support has been installed on the thruster. Lighting has been updated and bilge area cleaned and painted. The open, spacious feeling of the forward master stateroom is enhanced by the 7’+ headroom, overhead hatch, and four large, opening portlights. The generous storage provided by the two hanging lockers and the dresser is supplemented by drawers under the walk-around, standard queen berth. Soft chines prevent the slapping sound often associated with forward accommodations while the location at the bow provides ventilation superior to mid-ships staterooms. The ensuite head for the master stateroom features a roomy stall shower with molded in seat and teak floor grate. Ventilation is provided by the solar powered overhead fan and portlight. High quality Scandvik fixtures assure good control of water flow and temperature. Ample storage and four towel bars assure the comfort and convenience of her owners. Comfortable steps lead directly from the pilothouse to the spacious flybridge, assuring handy and safe access, even when at sea. Duplicate engine instrumentation, controls, and navigational electronics make running from here ideal. The “L” shaped settee provides plenty of seating and deck storage. A large bimini provides protection from sun and rain while seated in the comfortable Murray Brothers helm chair. The boat deck provides access to the 11′ Novurania dinghy mounted athwartships and has a custom table designed for an electric grill. The spar style aluminum mast is mounted to the aft face of the settee. Just aft of the flybridge, the boat deck provides access to the 11′ Novurania tender. It’s a great spot grilling, enjoying the views at the dock, or for extra storage. Spreader lights on the repainted and rewired spar style electronics mast, make working at night a little more possible. The Marquipt davit has been serviced with a new motor, cable, and controls. Wide side decks on both sides, with newer non-skid paint, make line handling a breeze and allow easy access from cockpit to foredeck. Spring cleats are conveniently located in the toe rail out of the way of foot traffic. Forward boarding gates provide access when docks are fixed or when berthed bow in. The freshly painted fore deck is easily accessed via the wide side decks on both sides. The Lewmar windlass easily handles the 60 lb stainless steel Ultra anchor. 200′ of 3/8″ ACCO G4 chain and 100′ of 1″ line allow for dropping the hook nearly anywhere. A saltwater washdown allows cleaning of ground tackle while a freshwater outlet makes washing the foredeck and trunk cabin a snap.